Interest in Sleeping Beauty is extremely high right now, thanks to Disney’s live action take on the story, Maleficent.The latter stars Angelina Jolie in the titular role, taking the Sleeping Beauty narrative and telling it as a story from the villain’s perspective. With Maleficent hitting theaters at the end of the month, Disney felt now would be a great time to announce that the movie’s animated precurser will be getting the Diamond Edition treatment. You may already own a DVD copy of the classic canon flick, but on October 7, Sleeping Beauty will be hitting Blu-ray Diamond Edition (although not Blu-ray), Digital HD and Disney Movies Anywhere for the very first time. 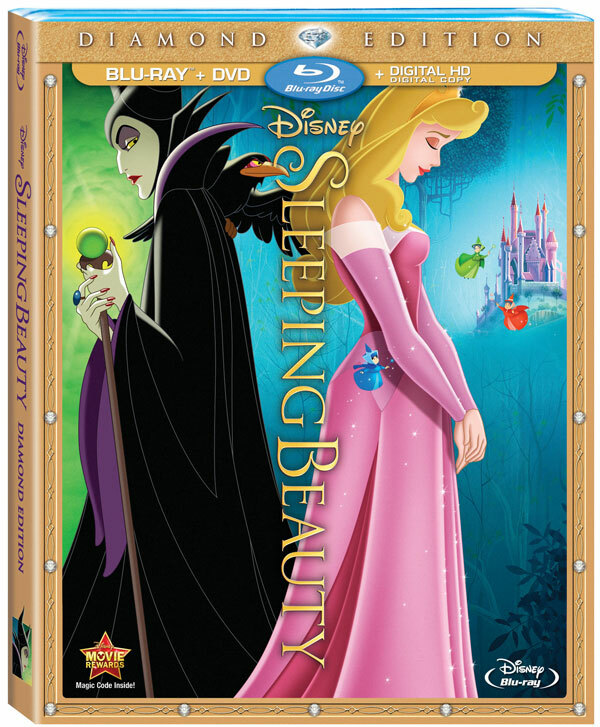 I’m actually a little surprised that Disney didn’t market the set months ago in order to coincide the release of the new theatrical film with the Blu-ray edition of Sleeping Beauty. It seems like a lot of people would be more likely to nab a copy of the animated flick if the story was fresh on their minds. Since I’m not a marketing guru, however, I guess I’ll just have to assume that Disney has its act together and there are reasons Sleeping Beauty won’t be hitting Blu-ray and Digital until this fall—maybe due to the fact the reboot should be more of a reinvention than a live action rework? Disney has toyed with the extras, look and feel of the studio’s Diamond Edition sets over the years, but recently the company has started to standardize the format. Fans will usually get the classic DVD extras with any given Blu-ray set, as well as a few formatted extras, including the new "OKE" extras, which allow kids to sing along with their favorite songs from the movie. With Sleeping Beauty, there are some random extras, including an art extra looking at the creation of a paper mache Maleficent and a look at one of Disney’s parades hosted by Modern Family’s Sarah Hyland. Most of all, the studio seems to be tying in the live action Maleficent with the original Sleeping Beauty, so if your kids are still interested in the tale by the time fall rolls around, this may be one to add to your collection. In the meantime, you can go ahead and check out the complete list of extras, below. Blu-ray extras are denoted with the word "New" and previous DVD extras are denoted by the word "Classic." New "The Fair (With Deleted Character – The Vulture)" – In this version of the story, the fairies do not take the Princess to live with them in the forest. New "Arrival Of Maleficent (Alternate Scene)"